OPCW investigators have yet to receive access to the chemical weapons attack site. The U.S. said it is concerned that Russia may have tampered with evidence of a suspected chemical gas attack in Syria prior to investigators reaching the area, Reuters first reported this week. The United States also accused Russia of blocking chemical weapons experts from visiting the site, despite having U.N. clearance to do so. Investigators from the Organization for the Prohibition of Chemical Weapons (OPCW) traveled to Syria last week to gain access to the site of the suspected attack, in Douma. But the investigators have yet to gain access to the site – Russia and Syria blocked them. Russian Foreign Minister Sergei Lavrov told the BBC that Russia has not tampered with the site since the April 7 chemical attack that is suspected of killing dozens of people. The United States, U.K. and France launched a strike on Syria on Friday in response to the chemical attack. A Russian defense ministry official said that OPCW investigators would be heading to the site on Wednesday. 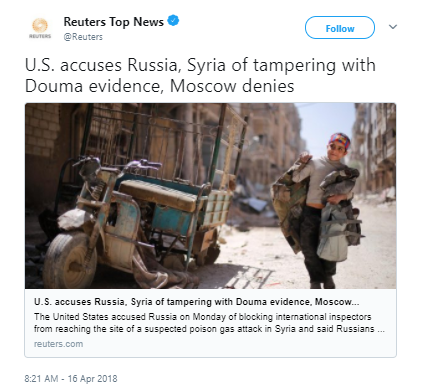 Syrian state media said that the OPCW entered Douma on Tuesday, but the OPCW has yet to confirm those reports. British Ambassador Peter Wilson said that while the inspectors were given the green light from the U.N., Russia and Syria have yet to guarantee their safety. Russia said that the reason for the delay was because of the missile strikes carried out by the U.S, France and Britain that hit chemical weapons facilities in Syria. “We called for an objective investigation. This was at the very beginning after this information (of the attack) appeared. Therefore allegations of this toward Russia are groundless,” Kremlin spokesman Dmitry Peskov said. Last week, Russian officials claimed that the chemical weapons attack was staged.